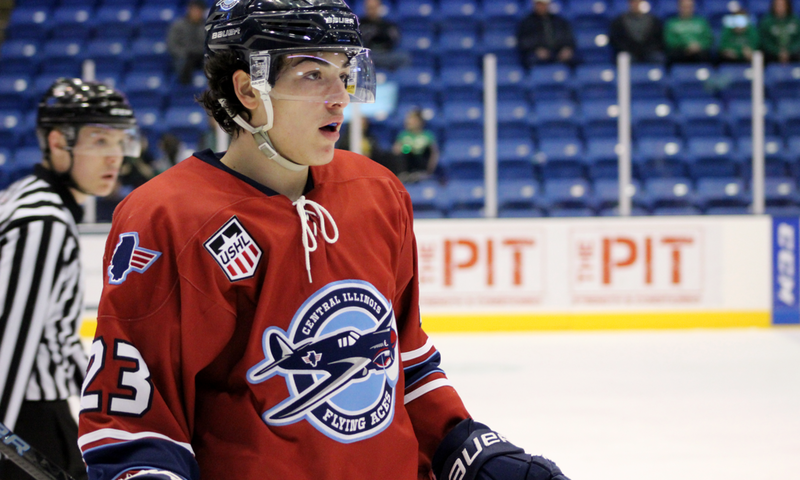 GENEVA, Ill. – The Central Illinois Flying Aces fell, 6 to 5, to the Chicago Steel in a back and forth game. The teams exchanged one-goal leads throughout the first two periods, but the Steel came out fast during the third to go up by three. The Aces continued to push back and made it a one-goal game, but ran out of time to find the tying goal. The Steel got on the board first after an offensive zone face-off win. Christian Sarlo received a pass in the low slot from below the goal line and quickly put it past the goaltender early in the first. Under two minutes later, Connor Mayer (Champlin, Minn.) stole the puck from a Chicago player after a Chicago center ice face-off win. Mayer took the puck into the offensive zone and wristed it five-hole to tie the game. Chicago netted their second of the game in the back half of the first period on the power play when Josiah Slavin potted the rebound in front of the net from a shot from the point. Once again, the Flying Aces did not let the Chicago lead stand as they tallied their next goal less than a minute and a half later. Michael Ferrandino (Lisle, Ill.) found Joe Dunlap (Windham, NH) with a stretch pass through the neutral zone. Dunlap’s initial shot was stopped, but Stephen Halliday (Toronto, Ont.) drove the net and was able to put the rebound past the flailing netminder. Midway through the second period, in four on four play, Lynden Breen (Grand Bay-Westfield, NB) exited the defensive zone and chipped a pass to Halliday in the neutral zone. Halliday quickly completed the give-and-go with Breen as Breen flew into the offensive zone. The University of Maine commit scored blocker-side with his twelfth of the season. Neil Shea scored for Chicago on the power play after he established presence in front of the net and picked up a loose rebound to tie the game again. Chicago opened the third period with three quick goals. The first came from Robert Mastrosimone when his shot trickled past the goaltender five-hole. Mathieu De St. Phalle tipped a point shot for the fifth Chicago goal of the game. Slavin picked up his second of the night on the backhand after a swift slot pass to make it 6 to 3. The Flying Aces cut the deficit to two on the power play. Ryan Siedem (Madison, NJ) passed to Cal Kiefiuk (Macomb, Mich.) on the right half-wall. Kiefiuk feathered a cross-seam pass to Trevor Janicke (Maple Grove, Minn.) at the left circle. The captain one-timed the puck for his twenty-second of the season. Central Illinois continued to fight to tie the game. With less than three minutes to play, Breen won a face-off and got the puck back to John Driscoll (Littleton, Colo.) at the point. Driscoll’s shot went off a body in front and Tyler Gratton (Pottstown, Penn.) found the rebound and backhanded it past the goaltender to make it a one-goal game. The Flying Aces continued pressure with the net empty, but could not get the puck past the Chicago goaltender for a final score of 6 to 5. The Flying Aces’ final game of the season will be Saturday, April 13th against the Cedar Rapids RoughRiders at 7:07 p.m. at Grossinger Motors Arena.